Heat gas or charcoal grill. Cut zucchini in half crosswise, then cut each half lengthwise into 4 spears. Snap or cut off tough ends of asparagus spears. Cut bell pepper into 8 strips. 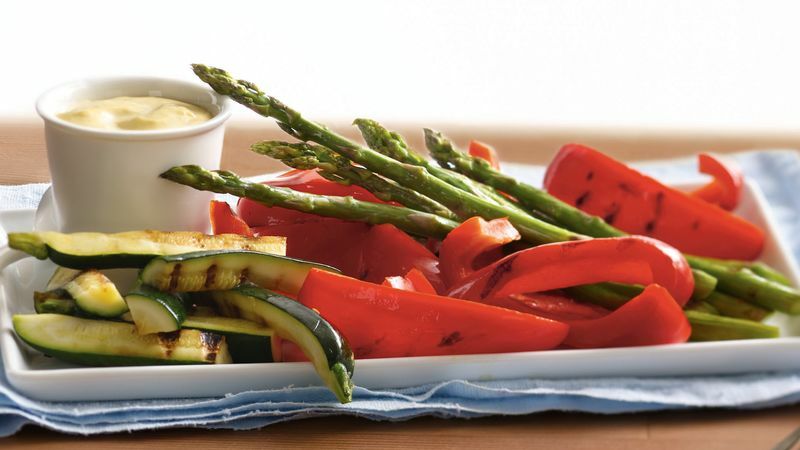 In ungreased 15x10x1-inch pan, arrange zucchini, asparagus and bell pepper in single layer. Drizzle with oil. Shake pan to coat vegetables with oil. Place vegetables carefully in single layer on grill over medium heat. Cover grill; cook 1 to 2 minutes or until lightly charred. Turn vegetables; cook 1 to 2 minutes longer or until lightly charred and just beginning to soften. Remove from grill; cover and refrigerate 30 minutes or until serving time. Meanwhile, in small bowl, mix mayonnaise, honey mustard, gingerroot and garlic. Serve with cold grilled vegetables.